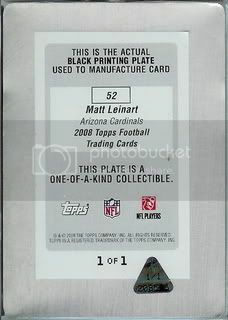 I remember being super excited when the Arizona Cardinals drafted Matt Leinart. His time here in AZ turned out to be kind of disappointing but he has a fresh start today. Matt should be the starting quarterback for the Houston Texans when they take the field later this morning. I wish him the best of luck. 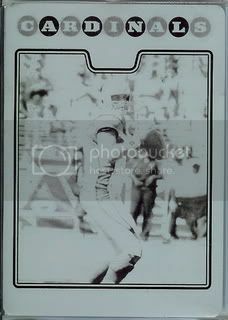 I grabbed this printing plate a few months ago. I know our 08 Topps collection primarily focuses on baseball but I couldn't pass this up for $5. 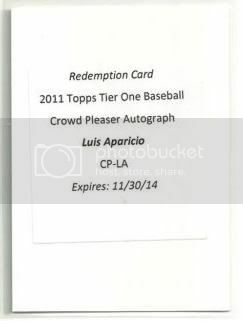 Here at My 2008 Topps Set Blog we're celebrating Black Friday with Black Border Parallel cards! Since this is the second year we've done this, I think it's safe to say it's officially a tradition. Getting things started early this year so you'll have some reading material while you're waiting in line at Wal-Mart to pay for your cart full of $4 toddler pajamas and two buck DVDs. 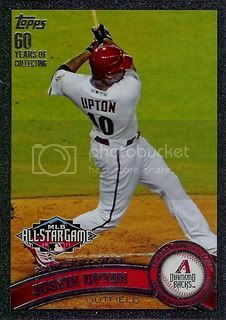 We picked this Justin Upton card up for our D-Backs / 2010 All-Star Game collection. It's numbered 33/60 on the back. I don't know much about this card. 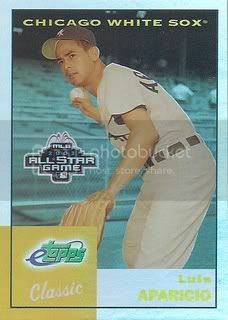 It appears to be some type of promo card that was given away at the 2003 All-Star Game Fan Fest. 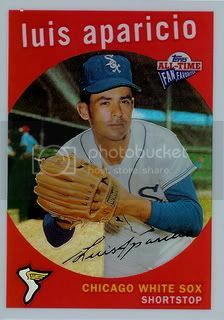 The All-Star Game was in Chicago that year so I guess Topps made a special card of Luis Aparicio to promote their eTopps website. The back has a $5 off coupon code. I'd share it but expired a long time ago. I really like this one. It's shiney and has a cool design and picture. As soon as I saw this card, I knew I had to have it. I even grabbed up the first one I saw with a reasonable buy it now. Yep, it's another Daniel Hudson for our unofficial Daniel Hudson collection. 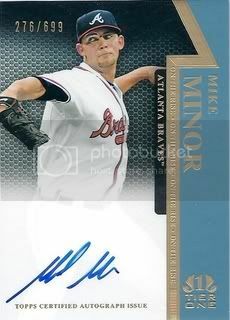 The next card we bought was of Atlanta Braves starter, Mike Minor. Mike was the 7th overall draft pick in 2009. I'm thinking there's a good chance he'll be a star soon too. The first is of New York Mets prospect, Fernando Martinez. It seems like this guy has been around forever but he's still only 22. As the back of the card points out, there's still plenty of time for him to become a star. Let's hope they're right. I'm sure Tigers fans are glad to have this guy back in Detroit. I'm glad to have his 2008 Topps cards signed. Who am I talking about? Gerald Laird, of course. 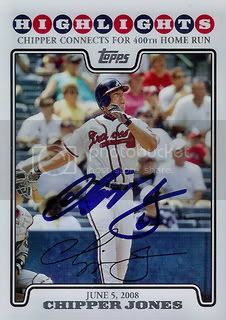 We got Chipper Jones's autograph. No big deal. Okay it's kind of a big deal. Hall of Famer, Bobby Doerr came through for us again. 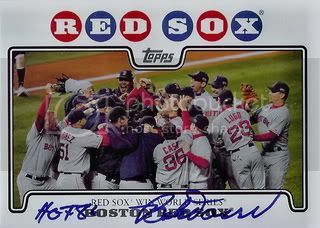 This time he signed the Red Sox celebration card from the 2008 Topps Boston Red Sox 55 card team gift set for us. You may remember that he signed the regular base version of this card for us too. That was back in April 2009. 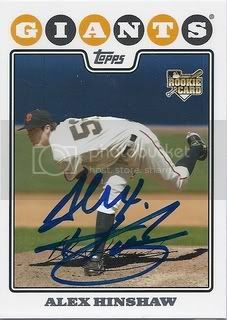 It was the 51st signed card for our 08 Topps set. We picked this one up off eBay for $2 shipped. I actually really like these 1975 mini jersey cards. They're pretty cool. Last week I mentioned trying to build up our collection of D-Backs cards. Well this is our first Justin Upton relic so we're making progress. I don't remember this set but I was glad to pick up this card for less than $2 shipped. 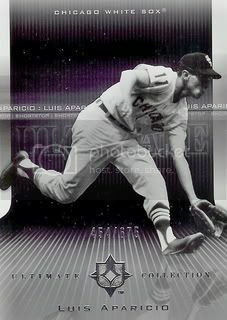 I liked it because it was numbered ( 454/675 ) and because it features a nice picture of Luis Aparicio that I haven't seen before. 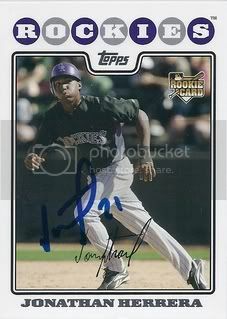 Jonathan Herrera spent most of 2011 on the big league roster with the Colorado Rockies. He played in 104 games and but didn't put up that good of numbers. Maybe 2012 will be a breakout year for him. We made a trade with TheBrooklynMet from Clear Cut Cards. We sent him the Ike Davis jersey card we pulled out of our Topps Lineage Hot Pack. 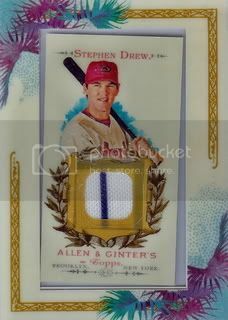 He sent us this nice Stephen Drew jersey card from the 2007 Allen & Ginter set. I'm slowly trying to build up my D-Backs collection. This one's a pretty sweet addition. I remember Action Packed being kind of a big deal in the early 90s. I remember them more for their football sets but they did come out with a few sets of baseball Hall of Famers too. 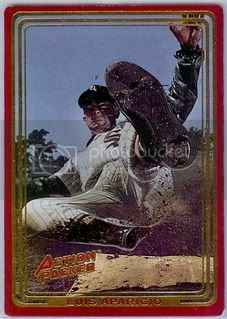 This card is from their 1993 set. I like it because the photo is almost identical to the cover on the April 30, 1962 Sports Illustrated cover. 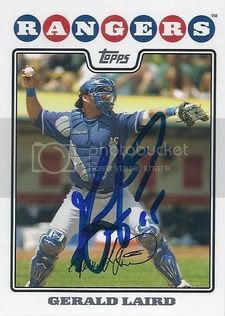 Ryan Church also signed his card from the 2008 Topps Mets Team Gift Set for us too. This one's an entirely different picture from his regular issue. John from Donruss 1982 is compiling a list of the 20 Greatest Sports Card Blogs of All-Time. 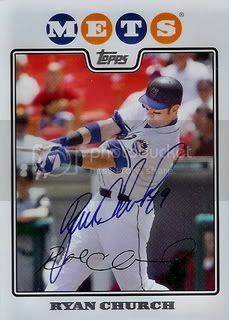 In case you missed it, My 2008 Topps Set Blog came in at # 18. With over 300 blogs currently on the Sports Card Blog Roll, I'm very honored to be part of his list. You can check out his post on our blog here. 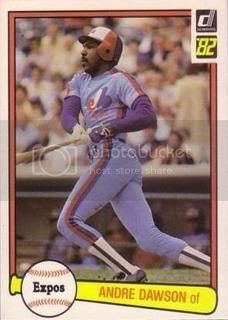 And please enjoy this 1982 Donruss card. It's of one of my favorite Hall of Famers, Andre Dawson. 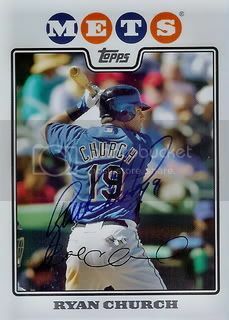 Got a nice TTM return recently from former New York Mets outfielder, Ryan Church. Ryan signed his card from the 2008 Mets 14 card team set for us. This one's different from his regular issue that had him on the Washington Nationals. Day four of our "Five Days of Daniel Hudson" brings us a card that looks very similar to the one we posted yesterday. The only difference is that this one's a refractor and is numbered to 199. I'm a sucker for a nice refractor so I threw down a few extra bucks and picked up this one too. 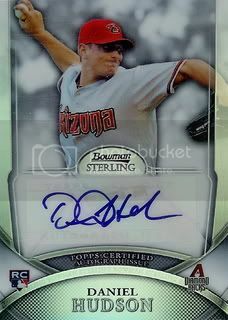 Our "5 Days of Daniel Hudson" continues with a 2010 release from the Bowman Sterling set. 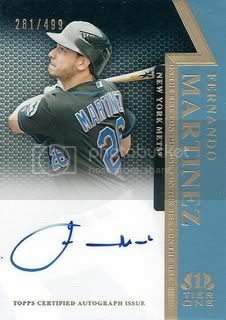 This one's a nice simple, shiney card with a sticker auto. I do like the small D-Backs logo in the lower right corner. 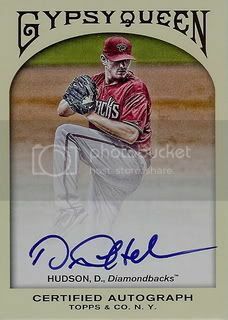 Also, Daniel's wearing the D-Backs grey away jersey which happens to be my favorite D-Backs jersey. Does anyone besides me follow Daniel Hudson ( @DHuddy41 ) on Twitter? Actually more importantly, are you following me ( @unclemoe ) on Twitter? If you're not, you should follow us both. 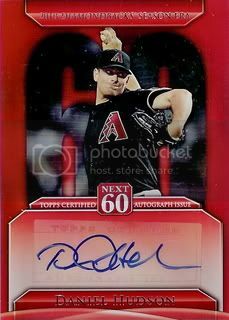 We've picked up a few certified autographs from Arizona Diamondbacks starter, Daniel Hudson recently. I thought I'd do a post for each of them over the next few days. Let's call it "5 Days of Daniel Hudson." Day one starts us off with a nice on-card signature from the 2011 Topps Gypsy Queen set. Gypsy Queen hit the blogosphere pretty hard a few months ago. It was everywhere. I even did a pack break. It's still a great set with a great autograph checklist. I love refractors. 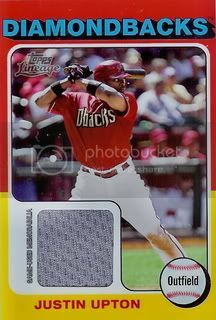 I didn't even remember that the 2003 Topps Fan Favorites set had refractors as inserts. 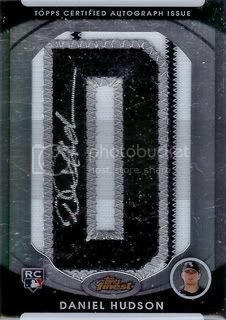 This card is extremely nice and is numbered to 299. I'm glad to have it as part of our collection.